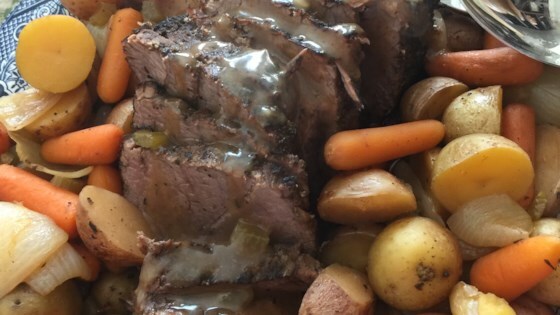 "This recipe I made up because I could not find one for this cut of meat and for the slow cooker. So I decided to experiment. Turned out great and the family loved it." Mix paprika, oregano, garlic powder, onion powder, salt, and black pepper together in a bowl; rub evenly over roast. Arrange potatoes, carrots, celery, and onions in the bottom of a slow cooker. Place roast atop vegetables. Whisk beef broth, Marsala wine, and gravy mix together in a bowl; pour over roast and vegetables. Cook on Low until meat is fully cooked and vegetables are tender, about 8 hours (or on High for 5 hours). Strain sauce into a bowl and whisk with flour until thickened. Serve on the side of roast and vegetables. I made this tonight and the whole family really liked it. I added mushrooms, though, and that was my husband's favorite part. I will be making this again. Thanks! For those who said this was tough, it is a must to cook on low for eight to nine hours to achieve maximum tenderness.